The University of the Philippines National Engineering Center (UP NEC) with the theme “40 Years of Serving the Nation through Engineering Solutions” celebrated its 40th founding anniversary last 23 February 2018 at the UP NEC Audio-Visual Room. In her State of the UP NEC Address, Dr. Rizalinda L. de Leon, Executive Director of UP NEC and Dean of the UP College of Engineering, discussed UP NEC’s key milestones for the past 40 years covering research and consulting projects, training programs, publications, and events. Dr. de Leon also harkened back to the founding of UP NEC highlighting the conceptualization, the founders, and Presidential Decree 1295 as the enabling policy for the establishment of the UP NEC. She also talked about the challenges that needed to be hurdled during UP NEC’s growth phase including those concerning infrastructure and facilities, manpower resource, and funding. Forward looking, Dr. de Leon concluded with a presentation of the strategic direction of UP NEC for the next succeeding years. Executive Director Dr. Rizalinda L. de Leon narrating the past, present and future of UP NEC. Dr. de Leon reported that UP NEC had a total of 29 technical consultancies and research projects from 1982 to January 2018. Of the 29, 19 projects were in partnership with government, 5 with industry, and 5 with development organizations. In terms of status, 20 were already completed, 4 are for final reporting, 2 are on-going, and 3 are for signing of Memorandum of Agreement. One of these projects is the “Development of Revisions to the National Building Code of the Philippines and its IRR to Mainstream Disaster Risk Reduction” which is partnership with The World Bank and Department of Public Works and Highways. The UP NEC implemented a total of 834 training programs from 2007 to 2017. Of the this total number, 673 were regular publicly-offered training programs, 117 were in-house or training programs customized to needs of certain agencies, and 44 were certification or training programs with series of topics and that award certification after successfully meeting the course requirements (e.g., examination, at least 90% attendance, etc.). Some of the certification programs offered include Master Black Belt Lean Six Sigma, Electric Power Distribution Engineering, Business Analytics, Corrosion, Facilities Management, and Public Procurement Specialist. The UP NEC trained a total of 20,698 participants, 15 of whom were foreign participants from countries including Bangladesh (8), South Korea (1), USA (1), Canada (1), India (1), Japan (1), and Myanmar (1). The UP NEC had 147 training resource persons from 2006 to 2017. The UP NEC publishes quality research works through Philippine Engineering Journal or PEJ. As of December 2017, the UP NEC had produced a total of 76 journals with 381 research works. According to UP Diliman Office of the Vice Chancellor for Research and Development, the PEJ had 69,805 hits, both views and downloads, from 2015 to 2017. Dr. de Leon ended her presentation with on-going initiatives and future plans for the UP NEC in the next coming years with emphasis on transferring to new building and location, solidifying “Tatak UP NEC” brand and marketing schemes, revamping website, applying for local and international accreditation of training programs and publication, creating and developing new platforms for the offering of training programs, and continuously improving operations and processes to meet the demands of a growing institution. She then invited everyone to be more active partners by training, collaborating, and publishing through the organization. After Dr. de Leon’s presentation, the UP NEC awarded its research project partners, training resource persons, and valued clients for their trust and commitment to the organization. Please see full list of awardees. 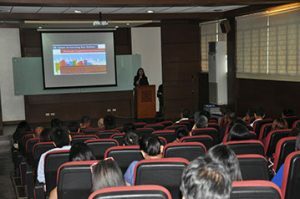 As part of the celebration, the UP NEC also organized 3 free lectures; (1) “Introduction to Professional Certificate in Engineering Management” by AMH Philippines Technical Resources Manager Engr. Jesus N. Matias, (2) “Overview of Process Improvement Tools and Techniques” by Shell Business Operations Continuous Improvement Specialist Mr. Ronal Aaron U. Po, and (3) “App Development: Making Ideas Happen (A Practitioner’s Guide to Taking an Idea for an App, From Vision to Reality Using the Agile Approach” by Stratpoint Technologies, Inc. Chief Executive Officer Ms. Mary Rose dela Cruz. UP NEC Deputy Executive Director Dr. Mili-Ann M. Tamayao welcomed the distinguished guests and participants. UP COE Associate Dean for Administration Dr. Nathaniel B. Diola read the official message of UP Diliman Office of the Chancellor. From Left to Right. 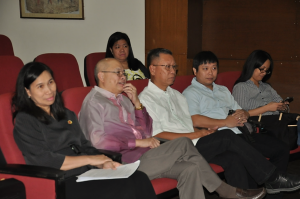 Dr. Rizalinda L. de Leon, Dr. Franciso L. Viray, Dr. Edwin N. Quirons, Prof. Ralph S. Jose, and Prof. Ma. Brida Lea Diola. Among those who graced the celebration were former UP NEC Executive Directors Dr. Franciso L. Viray and Dr. Aura C. Matias, former UP COE College Secretary Prof. Evangel Quiwa, UP NEC Constituent Centers Training Center for Applied Geodesy and Photogrammetry Director Engr. Louie P. Balicanta and National Hydraulics Research Center Director Dr. Roberto S. Soriano, UP Engineering Research and Development Foundation, Inc. Executive Director Engr. Alfonso A. Aliga, Jr., and other UP COE faculty members and staff. The key milestones of the UP NEC for the past 40 years displayed in an exhibit. 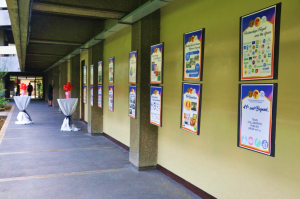 An exhibit showcasing the accomplishments of UP NEC for the past 40 years was displayed outside the AVR. Distinguished guests and participants were also treated to a simple meal and refreshments.